A mound of the termite species Odontotermes obesus in Southern India. Respiratory flows inside are driven by daily oscillations in ambient temperature. When they make their way into homes, some species of termites can be destructive pests. Their fungus-harvesting relatives in Africa and Asia, however, are known for their construction prowess, collectively building elaborate structures. The striking mounds built by some species of termites are thought to help regulate humidity and respiratory gas levels inside their subterranean nests, but determining how they do so has proven difficult to study. Now, researchers from Harvard University and the Massachusetts Institute of Technology have found that fluctuations in outside temperature over the course of the day create convection currents within the mounds that ventilate the termites' living space. They will present their results at the 67th annual meeting of the American Physical Society (APS) Division of Fluid Dynamics, held November 23-25 in San Francisco. Termite mounds are built from compacted soil and contain a network of tunnels that transport gases from the nest to the mound surface, where they diffuse through many tiny pores that also allow outside gasses to enter the mound. Because the individual pores are so small, however, the mound resists large-scale pressure-driven airflow such as that induced by wind—the ventilation must instead be driven by some other factor. To determine what this factor could be, the researchers studied Odontotermes obesus, a species of mound-building termite found in southern India. They measured airflow speed and direction inside both living and dead mounds, as well as carbon dioxide concentration. Carbon dioxide levels rose during the day and then, as the temperatures dropped at night, fell sharply. Air velocity also fluctuated in accordance with these daily temperature cycles. The researchers linked this data to the termite mound's structure: a central chimney flanked by smaller buttresses referred to as flutes. They proposed that exposed flutes respond quickly to changing temperatures throughout the day, while the temperature in the internal chimney remains relatively constant. "When the flutes are warm and the center is cool, air expands and rises in the flutes, contracts and sinks in the chimney, and vice versa," explained Hunter King, a researcher from Harvard University's School of Engineering and Applied Sciences. "The result is a twice-daily inverting convection cell within the mound that brings stale air from the nest to the surfaces of the mound." Their results provide an answer to a longstanding biological mystery. 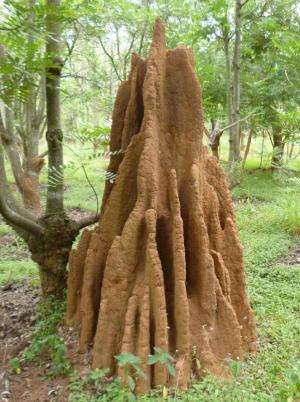 "The termite mound, a striking example of decentralized swarm construction, represents a surprisingly clever solution—an external lung for collective respiration, which relies on temperature fluctuations rather than constant heating or direct external forcing," said King. King and his collaborators, Sam Ocko and L. Mahadevan, plan to carry out similar tests on the mounds of other termite species to determine whether the mechanism is generalizable. They also hope that their discovery could provide inspiration for human-engineered systems. "Certain architects may find in these termites applications for passive human architecture," said King.